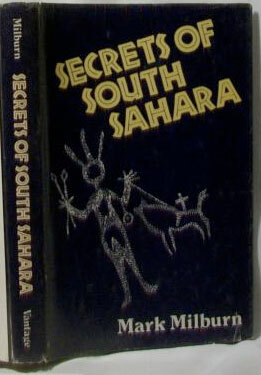 A curiosity in pre-Islamic tombs (aka ‘funerary monuments’) of the Sahara lead me to Secrets of South Sahara (£15 on ebay), Mark Milburn’s account of a solo expedition ostensibly to the western Aïr mountains near Arlit (Niger) in 1976-7 to study pre-Islamic monuments. I figured it would make a more digestible introduction to the subject than the many dry or technical academic studies easily found on the web which anyway tend to be localised and/or specialised. I was familiar with the name and am sure I once read another book of his, but Secrets seems to be the only one available. 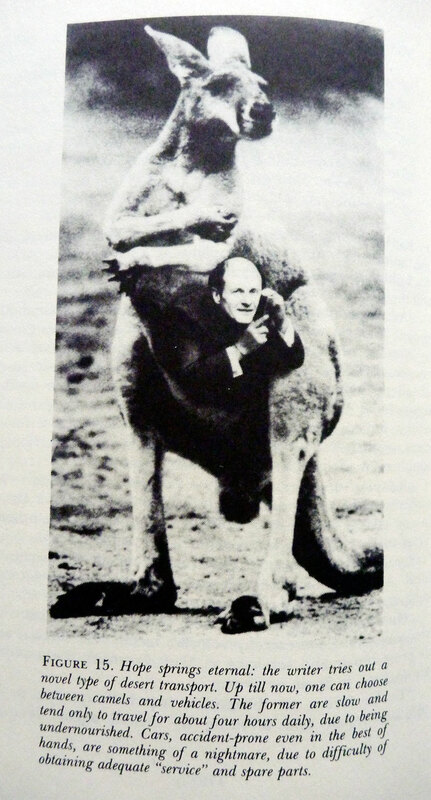 Mark Milburn was also mentioned in the Sahara Handbook (1980) as an explorer and scholar of Saharan pre-history, through in this book he never describes himself as a professional archeologist or academic, and comes across as merely a curious and well-read enthusiast. That may be incorrect or have changed since, as even today Milburn contributes many papers to publications in Spanish, German and French on the subject, including Sahara Journal as recently as last year (you get the feeling he may have helped found SJ and he’s even helped fund research in the Sahara). It’s hard to be sure about any of this as there’s little about [Dr] Mark Milburn on the web. He is perhaps a man of means. As an account of desert travel just prior to what I like to call the Golden Era when things got easier for a decade or so, the book itself was rather unsatisfying and inconsistent in pace. To be fair to the author you get the feeling it was poorly edited by the American publishers who may have had little appreciation of the subject or knowledge of the area. And there is no map – always short-sighted with a book like this, so I’ve made a rough estimation on the left, based on his account. As you can see he covered a fair amount of ground in Algeria and Niger. The book starts with an overdetailed account of his descent from Germany to Spain to collect his desert gear stashed there. At times it reads like a diary and you’re left thinking, who cares what you had for breakfast or what letters you’ve received and from whom, let’s get on to the south Sahara. Already, the intense dissatisfaction with his vehicle has surfaced, as well as the people who service it, parts availability and so on – and it recurs right up to the very last paragraphs. It’s so bad he cannot even bear to utter the identity of his despised diesel, but from the photos it’s clearly a leaky-roofed 88” Land Rover. This scorn is perhaps more understandable when he admits that a previous expedition was curtailed when a gear lever snapped off at the base (a not-unknown flaw on Series IIIs). His was towed back (afaict) but you get the feeling that temperamentally Milburn was the wrong sort of Land Rover owner. Anyway the mid-1970s were the ‘Leyland years’ – the subterranean nadir of British automobile manufacture when the badly put together ‘Monday-morning vehicle’ was made three days a week – the other two they were on strike. This preamble drags on with protracted too-ing and fro-ing across the Morocco-Algerian border before he finally gets allowed into Algeria, followed by much grumbling about Algerian inefficiencies and inconsistencies. The county was then in the midst of a paranoid, Soviet-backed episode which I too recall from my early travels, a time when even photographing telegraph poles risked arrest. The Western Sahara war between Morocco and Algeria was just kicking off in late 1976 too, and there was some doubt that the Algerian border would be open at all, or that there was access to the Grand Sud. On his travels he encounters several other tourists exploring the Sahara and near In Salah meets up with a driver with similar interests. They set off east along the Tin Habedra piste towards Amguid village to check out some old tombs. The gnarly stage beyond Tin Habedra well was one of a few episodes where the author managed to evoke his majestic surroundings – elsewhere the grandeur passes un-noted. Once in Amguid, the two set about searching for tombs or just painting; MM himself treks up the escarpment for a better look over the many crescent tombs he finds below, but here, as later, he admits difficulty in getting a good photo of an entire structure when alongside it at ground level. It’s something I’ve found myself; they look so much better on Google Earth! From Amguid they nip down in the rain towards In Ecker where they encounter stragglers on the second Abidjan-Nice rally (precursor to the Paris-Dakar). Then a diversion west takes them out past Silet for more tombery and rock-art spotting around the twin peaks of Tiouiine. There are more shopping difficulties, intransigent clerks and tedious permiture on the lean streets of Tam (also my impression on arriving in ’82), then it’s off to Niger. On the piste down to In Guezzam I was surprised to read of the mass of crescent tombs the keen-eyed Milburn was finding, seeing as this was a well travelled route and I’d never heard of such reports from others. Perhaps most are too focused on getting to the other side. Google sat didn’t uncover much either, apart from a collection 140km northwest of In Guezzam as well as a few kilometres northwest of the border post (right; look for KenGrok’s blue ‘i’s on the regular Google Earth, among all the other clutter). In Arlit there’s more admin to unravel before stocking up and setting out with Bazo, a Targui guide, to explore a region just to the northwest of town. You suspect this may be a place Henri Lhote (of Tassili frescoes fame – often cited in SoSS) had reported on in the same year, and which may have been a revised destination for Milburn once his planned visit to the Western Sahara got nixed by the impending war. Accompanied by the agreeable and sharp-eyed Bazo, all sorts of fascinating discoveries are uncovered in this little-visited part of the Aïr; it is the core of the book. Like some others I know, Milburn seemed to be driven by an urge to uncover and classify and by doing so, understand. He shows an indefatigable enthusiasm for tracking down and logging these structures while speculating modestly on their origin and meaning, hoping that some day some pros will come down and do a proper investigation (those days seem long gone). He then shoots off back to Tam, then returns south to spend time in the Laouni region north of In Guezzam with another guy and where, surprisingly, many more ancient discoveries are made among what you presume are the outcrops of Gara Eker. Then it’s back up to Tam and alone up to In Salah where he undertakes a dash over to Illizi via Amguid with some Germans, a stage that gets covered in a page or less. 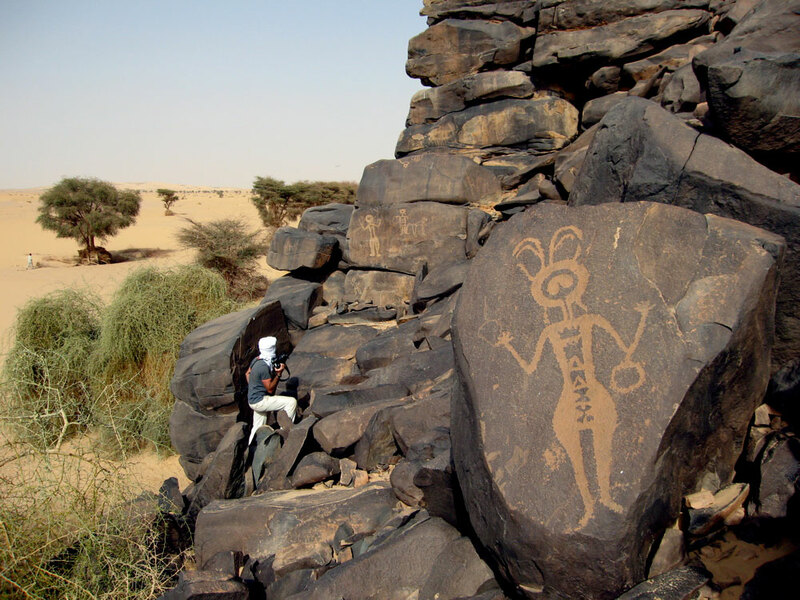 In Illizi they organise a camel recce of nearby Oued Djerat, the first Saharan rock art site to be well documented by Europeans back in the 1930s and which Lhote had written about a year earlier. 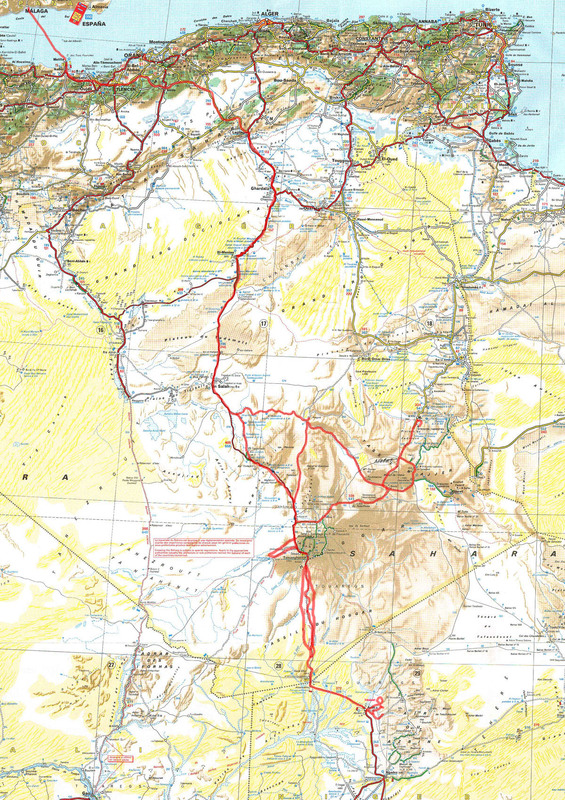 That done, MM then manages to drive some 600km southwest to Hirafok in a day in his 88” because the route north of Ilizzi was closed and Tin Habedra to the west too remote to do alone. He then zips up to the Moroccan border, delighted to be out of Algeria and a day or two later even more thrilled to be back in Spain. These last chapters end in such a rush when you think back to the protracted start of the book, you wonder if he’d suddenly exceeded a word count or ran out of time. A few weeks after writing this I was advised by someone who knows that: ‘… his book [SoSS] is deliberately misleading…’ as in, presumably, protecting new locations for later study. So overall I was disappointed by what was an uneven read from someone who even then, had much experience of the Sahara, and has acquired much more since. It would be nice to think one day Mark Milburn may retire and write ‘Memoirs of a Saharan Tomb Grader’. Among Brits he is rare and even appears to have a lighthearted edge if the picture left, suggesting the direction Landrover should have taken, is anything to go by. The regular grumbling about the lazy Spanish, sloppy Moroccan mechanics and any number of slack-arsed or obstructive Algerians, and not least his 88″, all get in the way of what must have been a great adventure and so should have been a better story. I was surprised to be unsatisfied by Secrets of South Sahara as a travelogue, but learned enough about the enigma of pre-Islamic tombs (as well as their very profusion, once you start looking) to make it worth reading. It just reminds you how much more there is to see of the Sahara once you slow down and look closer. The book has a few so-so photos; you’d think he must have come up with better; perhaps they were saved for other publications. The few graphics of tomb layouts are much better. The cover itself is a graphic of the intriguing ‘Air man with handbag’ which the author never saw, but mentioned that Lhote found repeated over much of the Aïr. 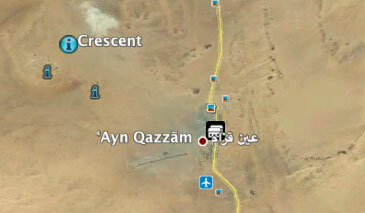 We ourselves found one at the popular site of Anakom (right) on the east side of the Aïr. This entry was posted in Desert Babbles (blog) and tagged air mountains, Henri Lhote, land rover owner, mark milburn, Oued Djerat, pre-islamic tombs in sahara, sahara book reviews, sahara funerary monuments, Secrets of South Sahara, Secrets of South Sahara review on February 12, 2012 by Chris S.